I love sharing recovery stories and am excited that author, educator, and advocate Debbie Corso has written an inspiring book that I know will help others. Below you'll find an email interview with my friend Debbie about writing, effective treatment, and what it's like to be on the other side of BPD. Who is this book for? Who did you have in mind as you were writing it? I wrote this book primarily for people suffering from borderline personality disorder (BPD), BPD traits, or emotional sensitivity. Stronger than BPD is an empowerment tool. It helps destigmatize BPD, de-pathologize emotional sensitivity, and it offers scientifically validated Dialectical Behavior Therapy (DBT) skills that have helped me and countless others learn to manage intense emotions and thrive in this world. I also wrote this book so that loved ones, as well as professionals, will be encouraged that it is possible for their family member or client with BPD traits to recover and go into remission. It is possible for their loved one or client to be in a very difficult place today and to no longer meet the criteria for a borderline personality disorder diagnosis in the future. 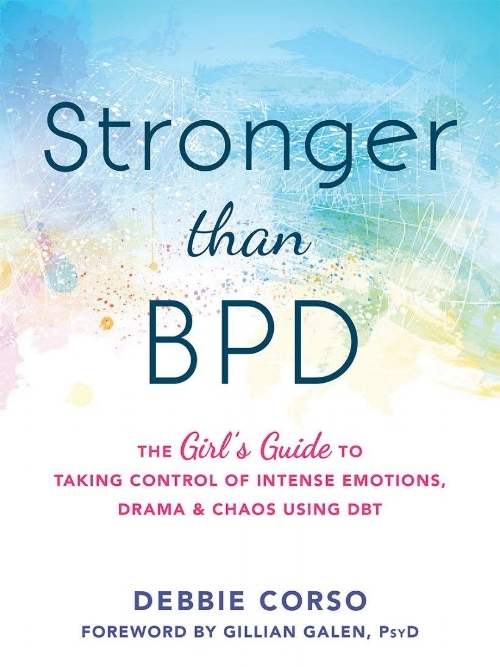 Was writing Stronger Than BPD personally challenging to write? There were some sections that were particularly challenging to write. Although I have been quite an open book about my mental health journey with BPD, I sometimes still feel vulnerable sharing certain aspects of my personal experience. In some cases, listening to my Wise Mind in those moments meant that I found another way to write about a certain topic, but in other cases, it meant taking a deep breath and using opposite action to the fear—I put the information into the book even though it caused me a little anxiety, because I knew the potential for the example to help countless others who are struggling and suffering. It was also challenging to write about coping with a severe episode of multiple sclerosis. The reason I chose to push through and write that section was to show that these skills aren't just about coping with the day to day challenges and upsets we face, but they can also help us break down big life issues so that we can deal with those skillfully as well. What was a typical day like for you when you were writing Stronger Than BPD? A typical day was at my desk, sitting by a window, looking at the trees and rain while writing. I'd make myself a cup of herbal tea or have some bubbly water nearby. Other times, I'd head to Starbucks or the library to write. I'd turn on classical or spa music. I can only listen to music without words while I write. What has DBT meant to you? How has it changed your life? DBT has absolutely been life-changing, and that's why I so passionately teach it and spread the word on a global scale! DBT, for me, was like taking an Adulting 101 class. I learned so many skills that many people naturally acquire while growing up in a healthy home environment. I also learned skills that many people who do not have BPD traits, such as black or white thinking or fear of abandonment and rejection, take for granted. At first, I felt embarrassed that I didn't know things that seemed, as I learned them, should have been common sense for an adult. But we can't learn what wasn't modeled for us or taught to us, so I learned to accept this and treat myself with self-compassion. Learning these skills allowed me to learn to embrace my emotional sensitivity and manage my emotional intensity, which has allowed me to build a life worth living. I founded an online school (DBT Path) to teach others these skills. I have a wonderful therapist co-facilitator, and we teach DBT skills to people all around the globe. Yes, DBT has been totally life-changing for me! What is your favorite skill to use? Self-Soothing! I used to think self-care and self-soothing equaled self-indulgence or selfishness. It's just not true. I went from feeling undeserving of self-soothing to it being one of my go-to skills when I've problem-solved and there isn't an immediate solution to a distressing situation. This might look like going outside and getting some fresh air, making a blanket cocoon on the couch and watching a favorite TV program, or having a square of really nice dark chocolate. Do you think that anyone can recover from BPD using the skills from DBT? I wish this were the case, and I know that DBT has and can help many, many people with BPD. The reality is, everyone is different, and some people may respond to other modalities better. The most important thing for someone with BPD traits to do is be evaluated by a qualified mental health professional and then discuss treatment options that would be the best fit for them. That being said, DBT skills are helping people, including teenagers, with better interpersonal communication skills. They are helping entrepreneurs be more effective in their business communications. They are helping people with eating disorders. And, they are helping many people with Borderline Personality Disorder enter into recovery and remission. I think these skills have the potential to help many people with different backgrounds and challenges. Graphic design of all things. It's something that has not been an inherent talent for me. I've challenged myself by taking several courses, and I'm getting better! I love looking at and admiring the work of graphic designers. I'm a vegetarian who eats a mostly vegan diet...so my favorite pizza topping is veggies, and of course vegan cheese. You can buy Debbie's new book by clicking here. Congratulations Debbie!